Title : Is Anybody Out There? Beyond our skies...and imaginations. Are we alone in the universe, and if not, who else-or what else-is out there? Here are thought-provoking stories that explore such questions as: Do intelligent species invariably destroy themselves by nuclear war or ecological collapse? Are the sentient aliens that do exist just too far away? Do they exist in forms beyond our compreheBeyond our skies...and imaginations. 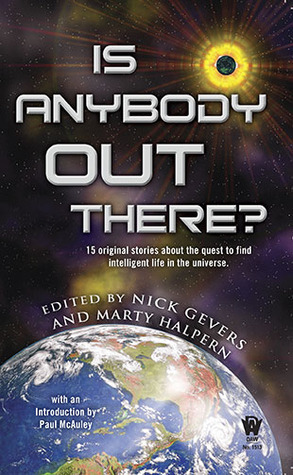 Are we alone in the universe, and if not, who else-or what else-is out there? Here are thought-provoking stories that explore such questions as: Do intelligent species invariably destroy themselves by nuclear war or ecological collapse? Are the sentient aliens that do exist just too far away? Do they exist in forms beyond our comprehension? Are they among us, but undetectable? These are just some of the possibilities explored by a stellar lineup of contributors. Decent compilation of short stories. A decent collection of short stories asking the question of the title.Some favorites:Residue by Michael Arsenault - A husband and wife looking at the night sky.The Dark Man by Kristine Kathryn Rusch - A shadow on the Spanish Steps that occurs at predictable intervals is investigated by a free-lance reporter.Timmy Come Home by Matthew Hughes - What's happening inside Brodies head? A bit of a mixed bag, but all pretty good. Very little hard/classic SF here, it's pretty much all that squishy psychological stuff. But some good metaphors for the human condition, memorable scenes, and enough references to the actual Fermi Paradox that it does feel like a real collection. This is a collection of answers to Fermi's question, "Where are they?" That is, if there are other sentient species out there, why haven't we seen any sign of any of them? This book offers sixteen different answers to that question, most of them well-written and enjoyable. Read from 7/24 - 7/25.